The beast in the east continues to look untameable despite his prowling being temporarily halted. Uche Ikpeazu, the burly Hearts striker, terrified Aberdeen’s defence on Saturday in the latest instalment of his Ladbrokes Premiership havoc-wreaking crusade. There is now a wait to discover whether he gets another chance to flex his muscles at Ibrox on Wednesday. 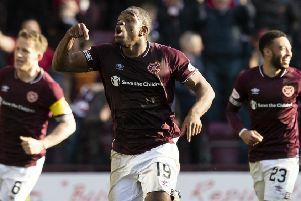 Ikpeazu was embroiled in everything throughout an enthralling contest between Hearts and Aberdeen. He enjoyed a running battle with opposing centre-backs Scott McKenna and Andrew Considine, missed an open goal, was booked for diving, scored the winner and was then substituted with suspected concussion before being stretchered down the tunnel. Medical advice will determine whether he faces Rangers. His importance to Hearts’ gameplan cannot be overstated, which would make his absence all the harder to accept. It is not the first time this man mountain has dominated proceedings since arriving in Edinburgh from England’s League Two last summer. It will not be the last, either. No Scottish defence has yet proven capable of successfully shackling the 6ft 3in centre-forward. He is not a technical No.9 full of twists, turns and dribbles. Nor is he an out-and-out goalscorer. He is a brute, a monster and a powerhouse who loves causing trouble wherever he goes. And Hearts supporters love him for it. Connor McLennan headed Aberdeen into an early lead during a first half controlled by the Pittodrie side. Hearts recovered after the break but Ikpeazu missed an open goal with his team 1-0 down. Joe Lewis, the visiting goalkeeper, failed to collect a long delivery and the Englishman somehow stroked the resultant loose ball wide of target. Hearts’ pressure did produce an equaliser after a solo run from inside his own half by the excellent Jake Mulraney. He was fouled by Considine inside the box and Sean Clare converted the penalty confidently. Then a frustrated Ikpeazu redeemed himself for that miss. Conor Shaughnessy’s free-kick upfield was misjudged by Considine with Ikpeazu lurking. The Englishman turned, got a toe to the bouncing ball ahead of McKenna and managed to steady himself to steer his finish beyond Lewis and into the net – causing Tynecastle to erupt as he ran for the technical area. It is not only Hearts fans worshipping him, either. “He’s unplayable when he plays like that. Having worked with him, I don’t think many centre halves would relish going up against him,” said team-mate John Souttar. “He’s a great asset for us. He’s a great boy as well. You could see how much he wants to do well for the gaffer and the whole backroom staff. Every time he celebrates, he’s over there and that speaks volumes. “I think everyone focuses on his power and strength but he’s got quality as well. He’s not just a battering ram. Sometimes that gets overlooked because he’s so quick and strong but he does have a lot of quality. Soon after scoring, Ikpeazu appeared to fall backwards and thump his head on the turf following an aerial challenge with Aberdeen’s Dominic Ball. He did get up and walked off but looked dazed and was soon wheeled round the touchline by paramedics and taken away to be examined. Souttar remarked that Ikpeazu is making it too easy for referees not to award fouls against him when he is man-handled – which happened several times at the weekend. “He’s not as good as that in training,” laughed the centre-back. “Nah, he’s an awkward player to play against. You saw that on Saturday. Two good centre-halves and he’s given them a tough game. Ikpeazu’s caution for simulation irked the Hearts manager Craig Levein. He intercepted a short backpass with the score at 1-1 and went past the advancing Lewis before ending up on the turf. Referee John Beaton brandished a yellow card and the player reacted with disbelief. Beaton also cautioned Ball, Lewis Ferguson, Arnaud Djoum and Souttar after a melee involving several players from both teams before the end. Tempers by then were fraying as Hearts secured a vital win to boost their European hopes. They moved to within two points of fourth-placed Aberdeen and four behind Kilmarnock in third. “We knew before the game how big this was. We showed a lot of character going down 1-0 at half-time,” said Souttar. “We were on the back foot for a lot of the first half but we showed a lot of character to come back out and play the way we did.